Let’s use the example of the qualification test swim for the Bosphorus Cross-Continental Race. The 800m qualifying swim usually needs to be completed in 18 minutes or less (they will select the fastest times, up to a certain number of swimmers). So, that makes it very clear what the swimmer’s performance goal needs to be. If this test swim in conducted in a 25 meter pool that breaks down into 32 lengths. At 18 minutes per 800 meters, that requires our swimmer to hold a pace of 135 second per each 100 meters, or 33.75 seconds for each 25 meter length. His ability to construct a 33.75 per 25m Pace depends on his ability to hold a certain combination of Stroke Per Length (SPL, or we say ‘Stroke Count’) and Tempo. For example the numbers shown in the diagram above will result in a 25m Pace of 22.5 seconds, or 90 seconds for 100 meters. Note: These combinations assume he will begin Stroke #0 at the 4-meter mark (just before the backstroke flags) and he will consistently start his stroke at that point. All these combinations equal 33.75 seconds per 25 meter Pace. Like gears on a bicycle he can pick one and train your body to stroke with it. Changing either one of the variables changes his Pace. For example, if you start at 23 SPL x 1.30 Tempo, but then start to lose concentration and add strokes to 24 or 25 SPL, you are obligated to increase Tempo to compensate for it (to hold the same Pace), or you will start swimming slower. The problem with increasing Tempo is that it increases heart rate, which means you are increasing energy consumption. 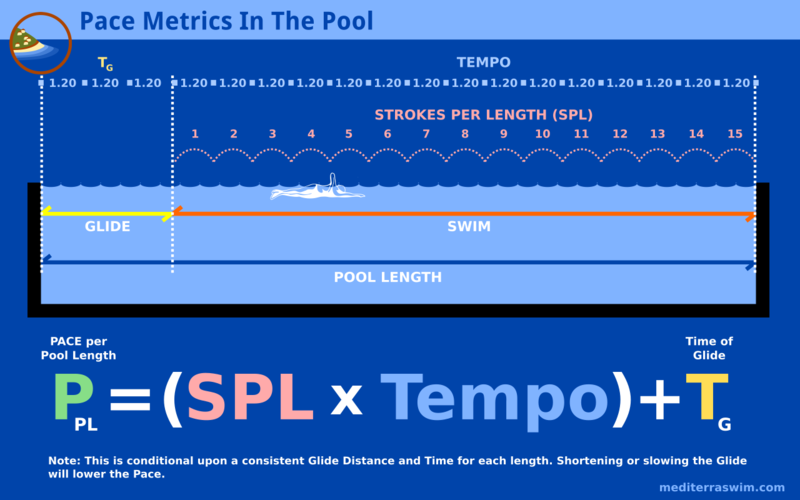 It is well documented in Olympic and Masters Racing over the last 30+ years that the swimmers who hold SPL the best (who prevent SPL from increasing too much) are the swimmers who win the races, not the ones who increase Tempo the most. Swimming harder does not guarantee that he will be able to achieve this. He has to train specifically to first achieve a certain SPL and hold it consistently. Then he needs to train to hold that SPL while increasing Tempo down to his target Tempo, then hold it consistently for the entire 800 meters. His ability to hold a certain SPL, and then hold a certain Tempo, means he has control over his Pace. Having control over his Pace means he has control over his Energy expenditure. If he cannot control SPL he cannot control Pace, and therefore, he cannot control how he uses energy. A swimmer cannot train hard, swim lots of meters every day without achieving these combinations and then expect to magically be able to swim at this pace on the test day. That is traditional thinking in swimming, but it is also mythical thinking. So which one is the best combination for our swimmer personally to aim for to pass the 800m qualifying swim test? How does he train to achieve his target SPL x Tempo combination? That is exactly what this program is about. The topic ‘Calculating Pace’ is closed to new replies.